This book argues that even in today's high-stakes testing environment, 'teaching to the test' need not be teachers' only focus as they introduce young children to mathematics. Judith McVarish demonstrates how building a community of learners and using problem solving to engage students can help teachers encourage students' disposition to creative thinking and reasoning-skills that can otherwise become lost due to the pressure of the many other expectations placed upon both teachers and students. 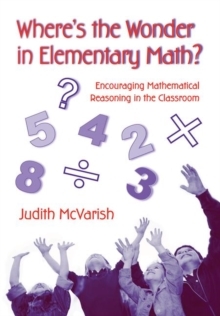 This book offers strategies for infusing mathematics learning and reasoning into elementary school classrooms while meeting curriculum and testing mandates. The teacher researcher component of each chapter provides a vehicle for teachers to bring their own expertise and questions back into the teaching and learning equation.